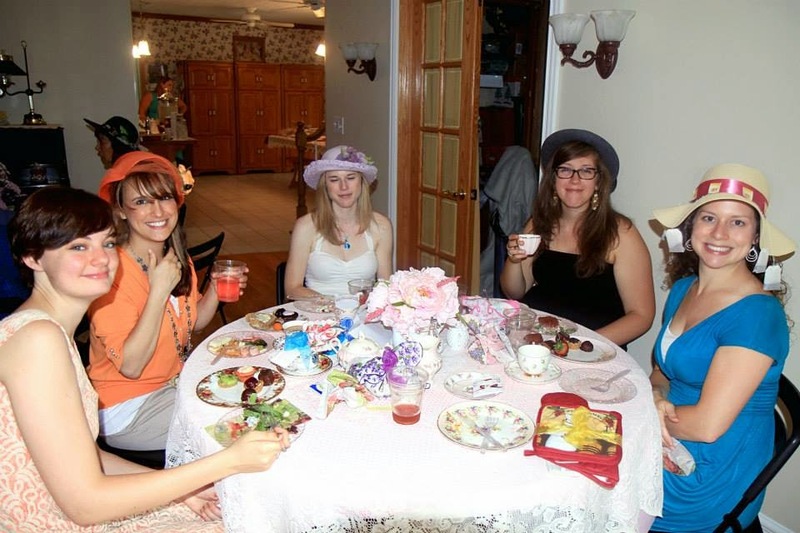 I love tea parties! 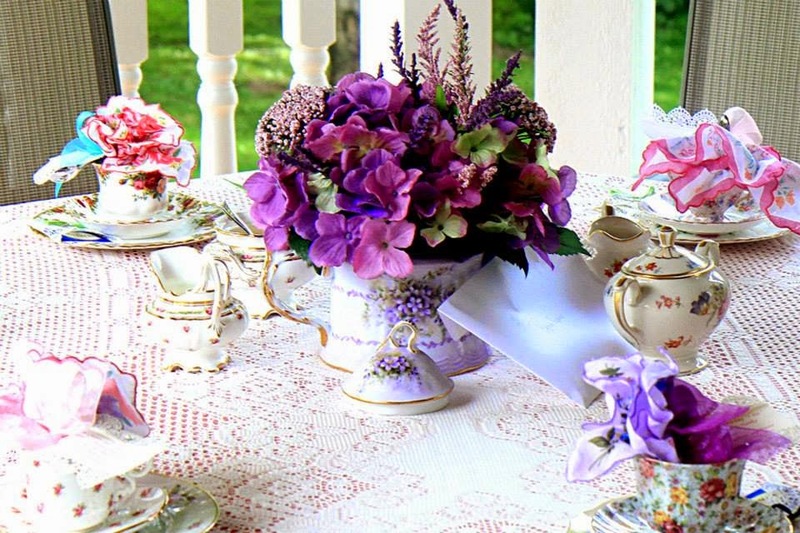 I love everything about them from the little finger foods to the delicate patterned china tea sets, demitasse spoons, funny hats, and doilies. 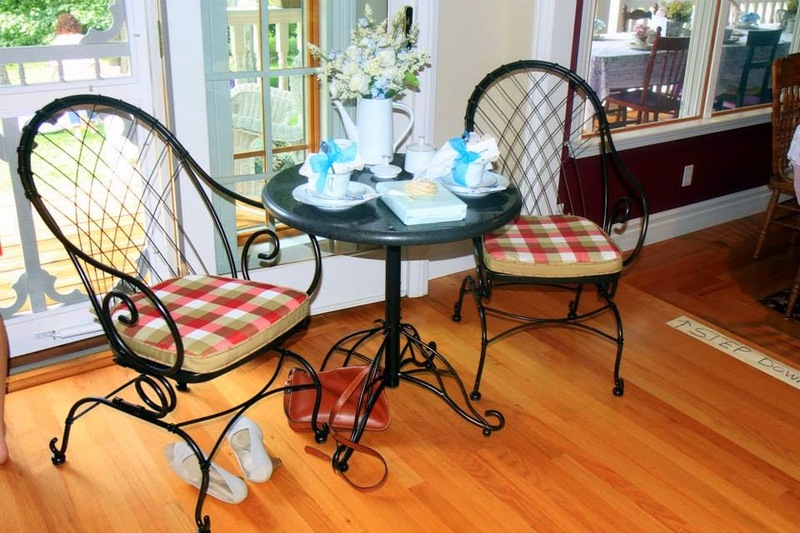 There is something about sitting back and sipping a cup of tea with other ladies that is reminiscent of simpler times, and it is always fun and relaxing. 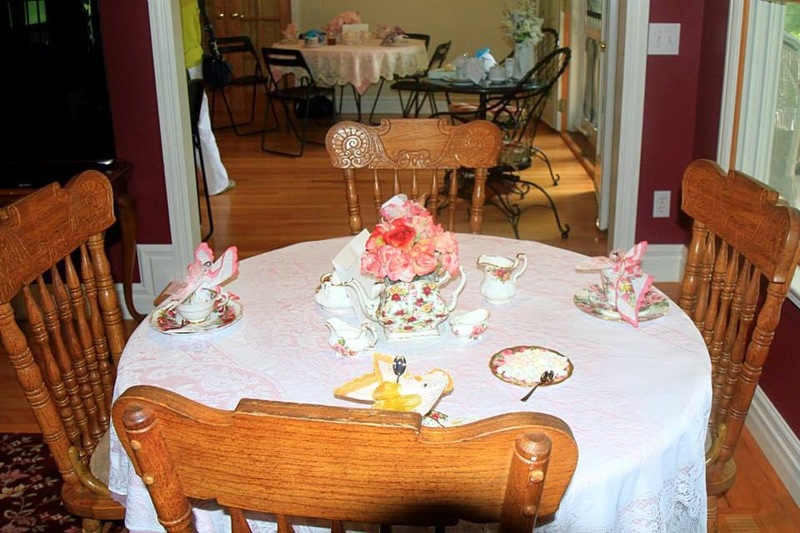 Whenever I get the chance to have tea at a tea house or get invited to a tea party, I am excited! Reserved for the Help... "you is smart, you is kind, you is beautiful!" 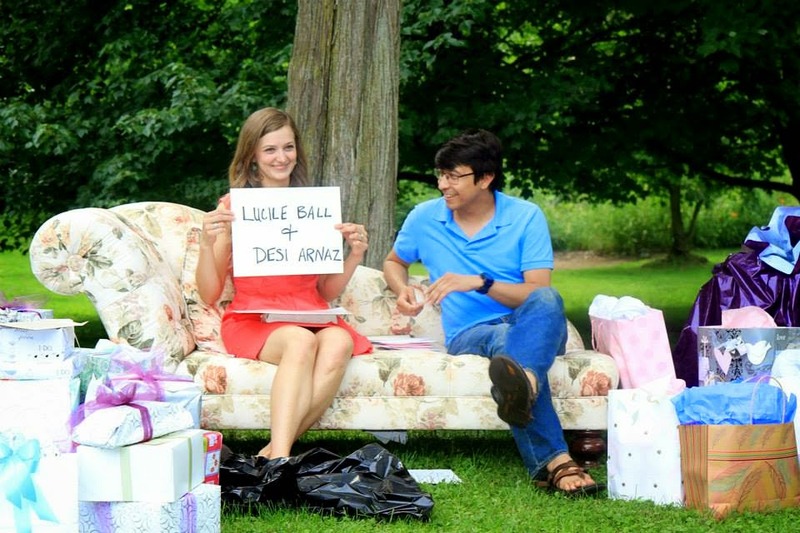 and it was actually a gift from Lauren's Mom & Dad for their new home! The shower was held at the Brides Aunt Mary's home, which is a super lovely country estate that sets off the road on several acres of property. 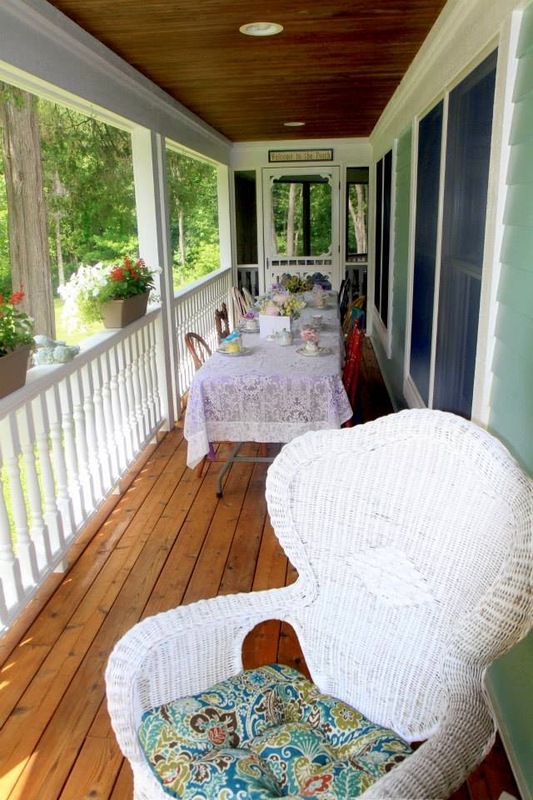 It is one of the loveliest homes I have ever been in, it is just one of those places that is warm and inviting. 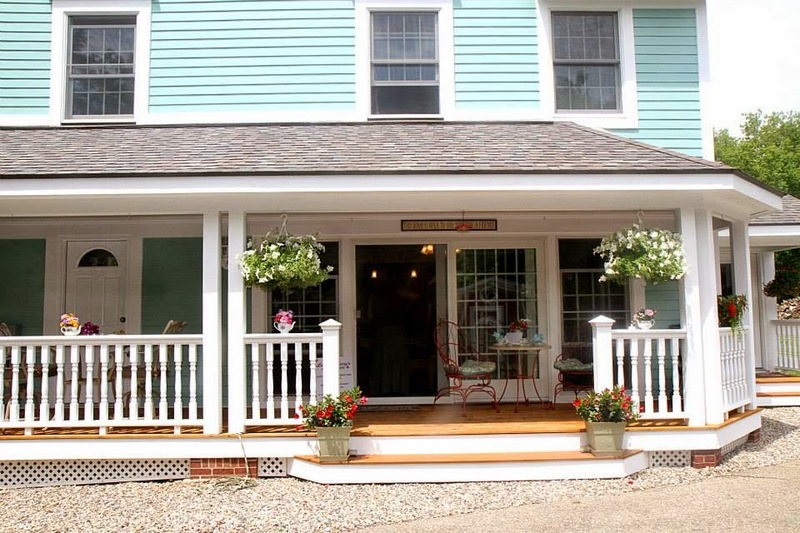 The house has a beautiful wrap around covered porch, a screened in porch, warm oak floors and many lovely details. 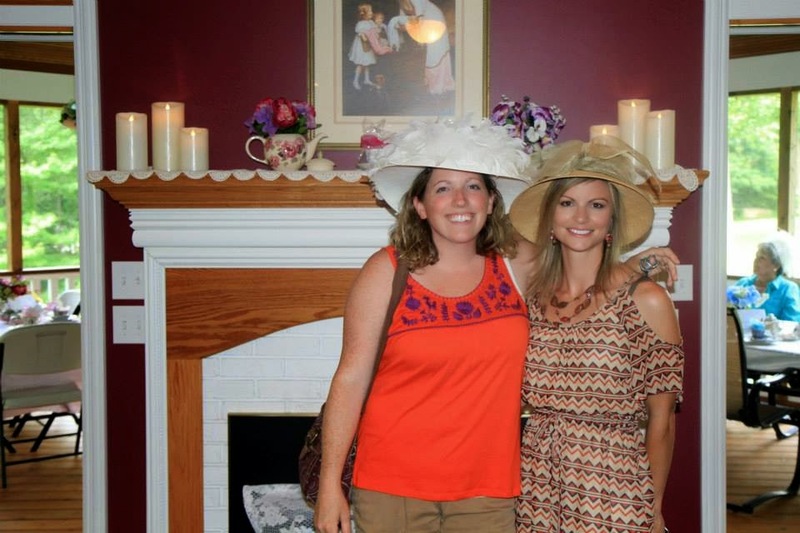 Their home was a perfect setting for the shower, you actually felt like you were in a Victorian tea house! 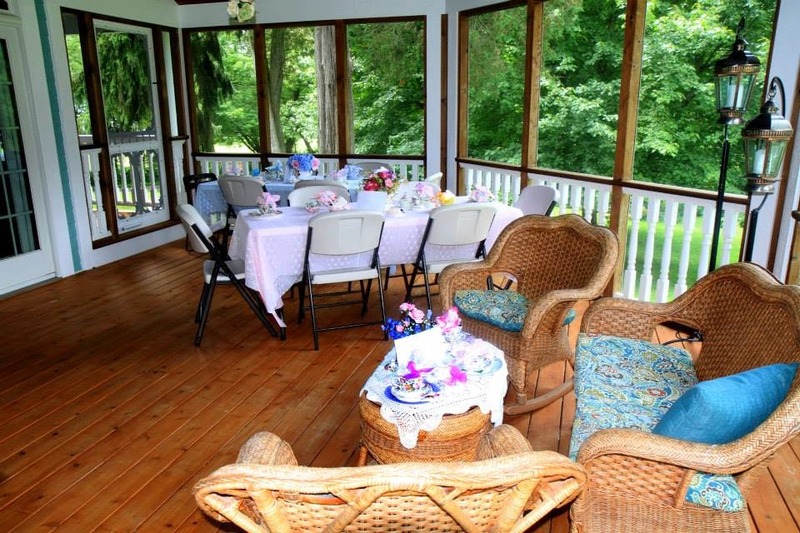 There were lovely tables set all around the house, and porch too! 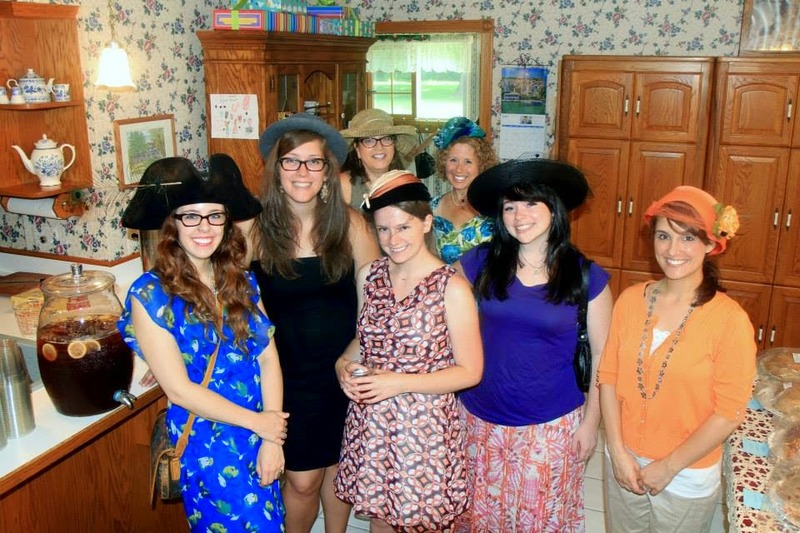 The guests were invited to wear a hat, but the Bride's Mom who is also a photographer has a huge collection of fun hats so if you didn't have one of your own, you could borrow one for the tea. Lauren and Larry made their way around to each table during the shower and picked out special "hats" they liked the best to award prizes to their guests. Some of the prizes were for most creative, most Downton Abby, best feathers, floppiest, funniest... etc. Ahoy Matey! Everyone loves a hat! 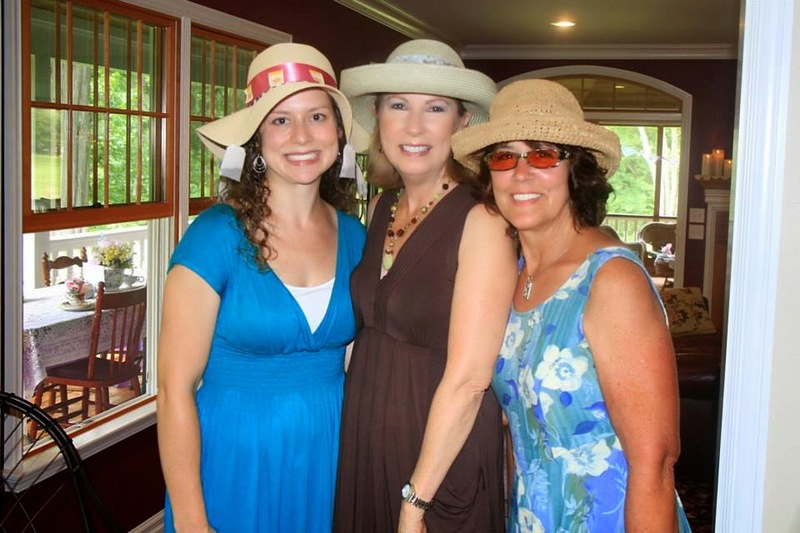 Gina and Jackie... beautiful hats, beautiful ladies! and it bagged a good prize! 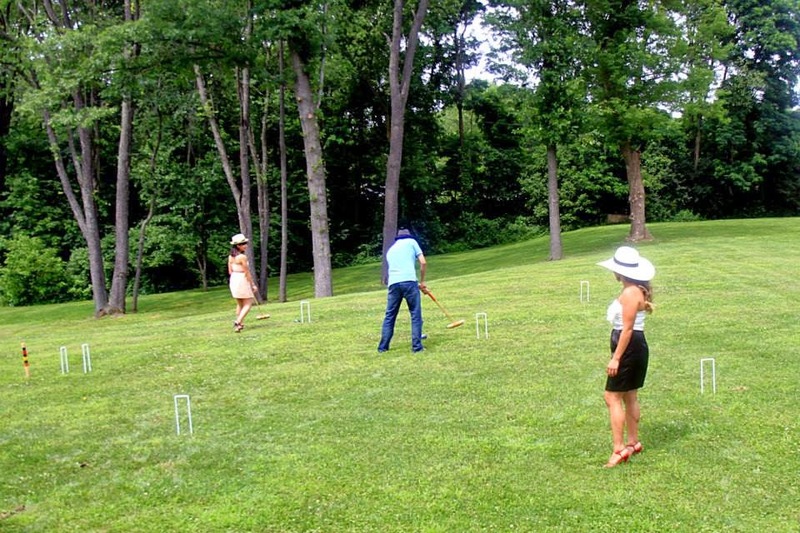 The games were simple but fun. One was a table game that my daughter Jessica made for the shower. She placed an envelope with a series questions and a bunch of "wedding rings" on each table and whatever lady got the question right at her table got a "ring" and the one that had the most rings at the end of the game won a prize. It was a nice icebreaker game that helped start fun conversation between the ladies. Some of the questions included, who has the funniest wedding story?... who's birthday is closest to the Brides?... who has been married the longest? The second game was a fun "Newlywed Game" that Karen, another of her bridesmaids made, where the young couple had to figure out how the other would answer certain questions! 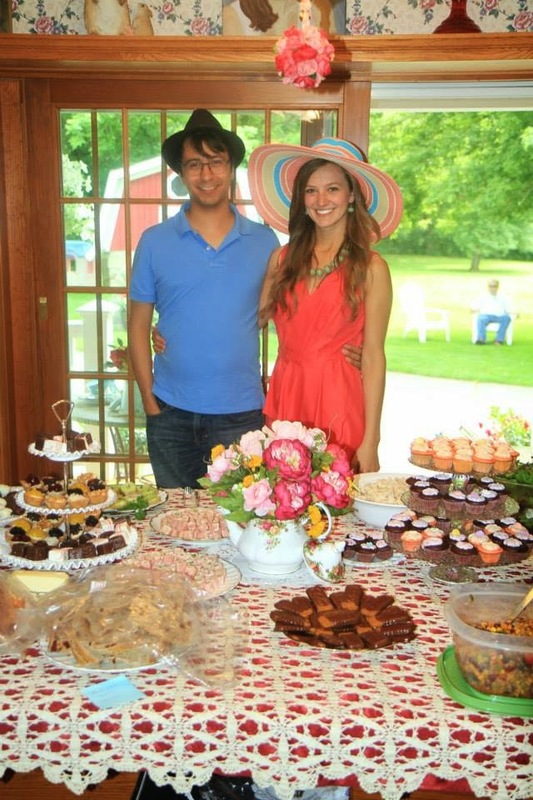 The food food was great, and was served buffet style on a large table with a lace table cloth. 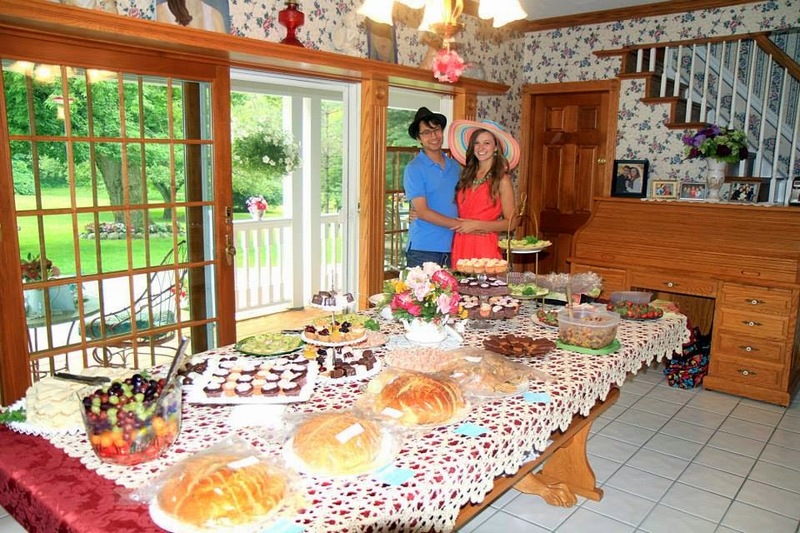 There were tea sandwiches, salads, bread, and fun finger desserts. If you read my blog post earlier this month (epic fail... petite four disaster!) you would have read about my attempt at petite fours, needless to say I contributed mini cupcakes instead! 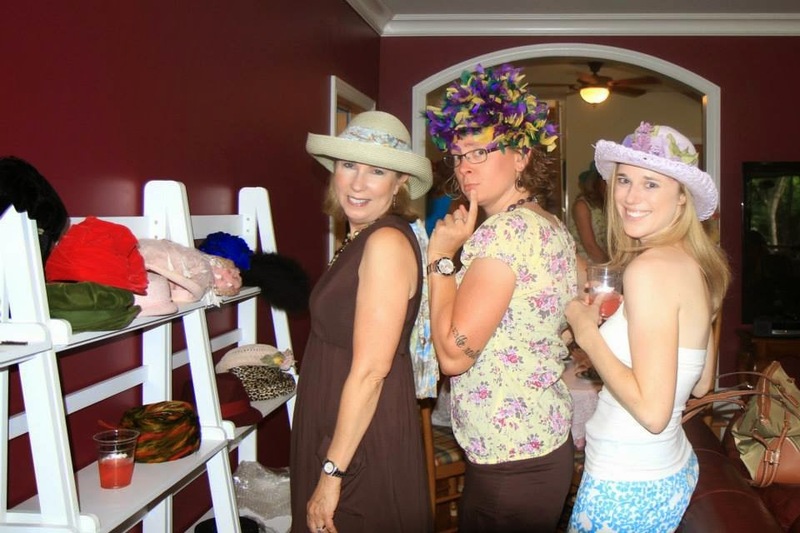 Shelly had a great idea for favors, and we enjoyed a fun afternoon with a few ladies crafting these on my back porch. 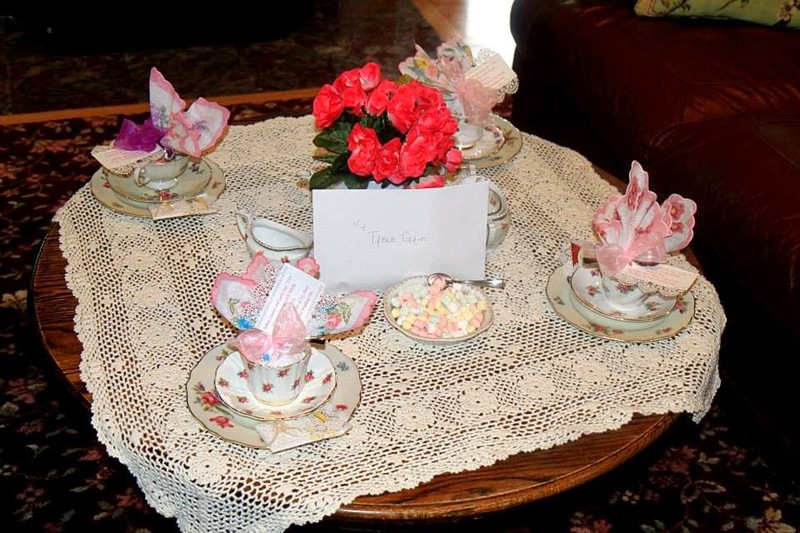 She purchased cute old fashioned hankies online, and tied them up with some yummy candies a cute bow, a demitasse spoon, and a tag with a poem that read... When Lauren and Larry say "I Do", here's a pretty little hankie just for you, to wipe the tears of joy away, on their special wedding day. 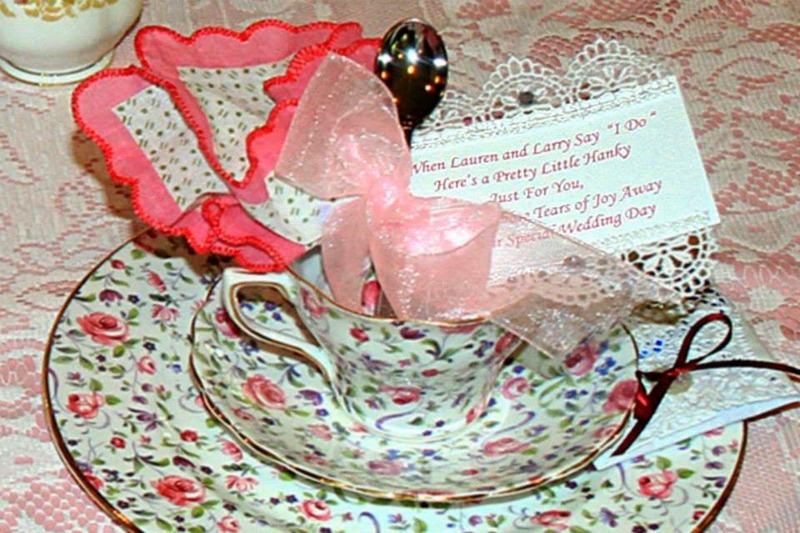 Each little hankie was placed in a tea cup at the tables... boy were they super cute! 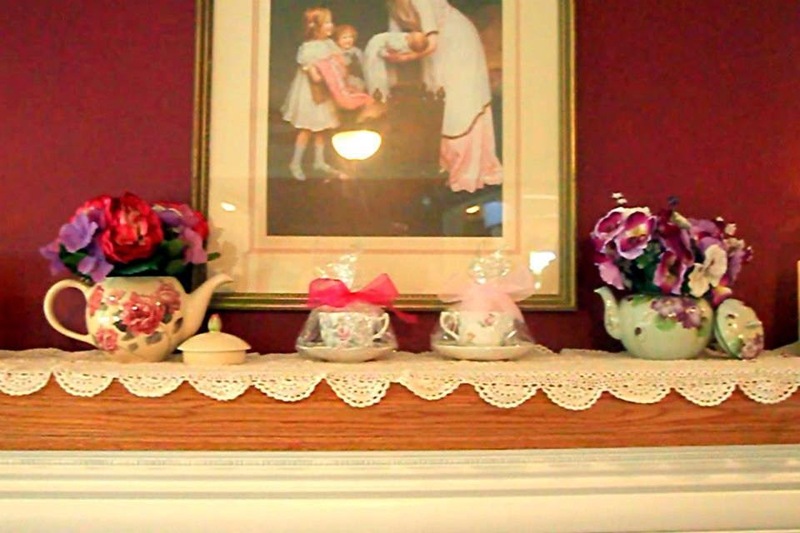 We also crafted little individual tea bags folded up in a paper doily envelope dressed up with a cute button and bow that was also placed at each table. 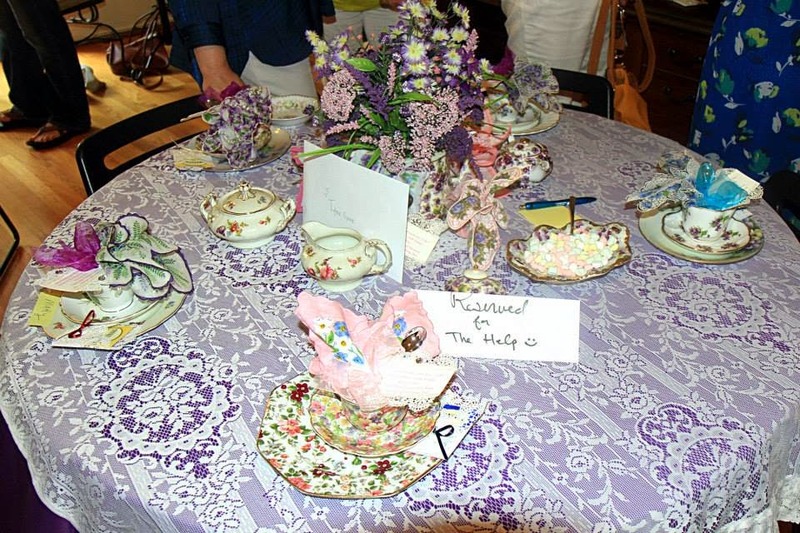 Also each table had a different tea pot with flowers for the centerpiece's. There were pink tables, purple tables, blue tables, it was absolutely gorgeous! if there was a M.O.B. (mother of the bride) of the year award, Shelley would definitely take home the blue ribbon, because the attention to detail was amazing! 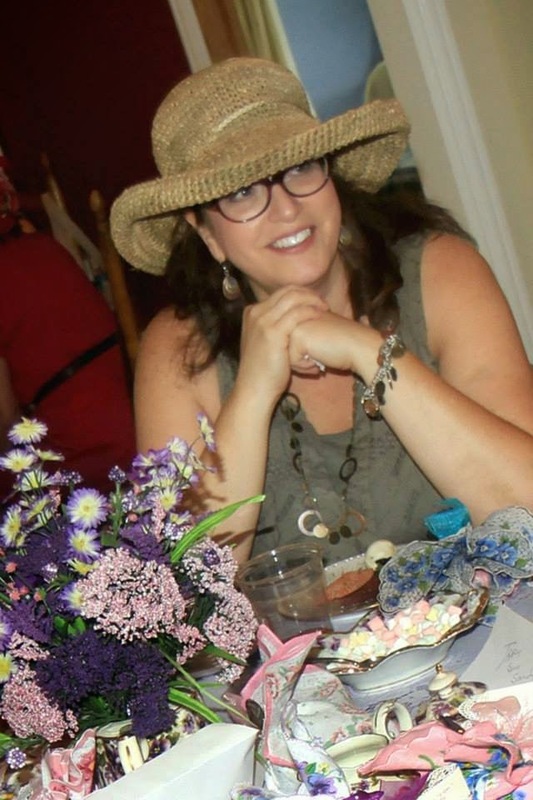 The hours of time, love, and creative energy that was put into creating this special day for her daughter and future son-in-law was evident in every detail... and every cup and saucer that was washed and packed away after! 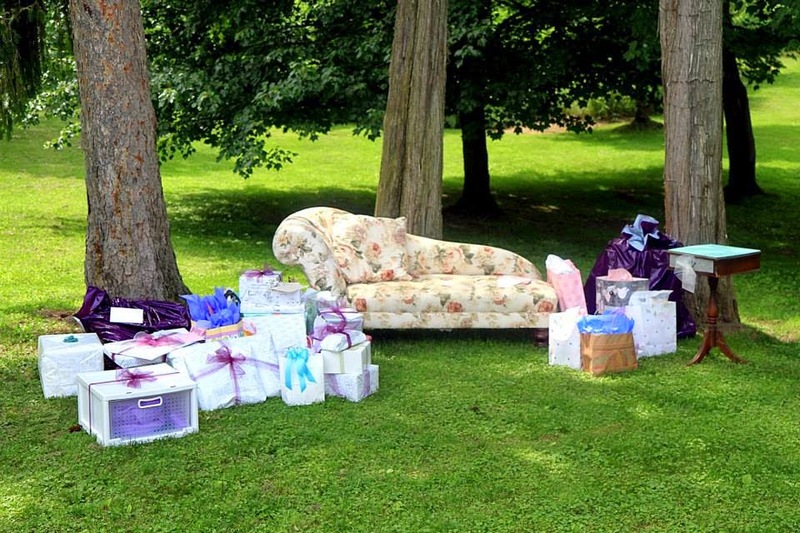 It was a beautiful warm summer day so when it came time to open up the gifts, everyone moved their chairs to the lawn to enjoy watching the happy couple! And what is a more perfect back drop for pictures than a beautiful floral chaise lounge against a gorgeous green backdrop! 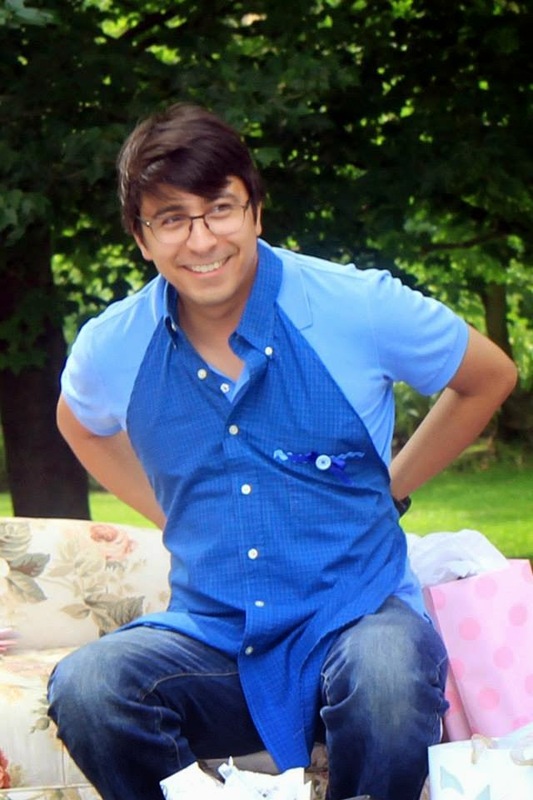 I think Larry liked "The Blue Spotted Owls Up-cycled Apron"! 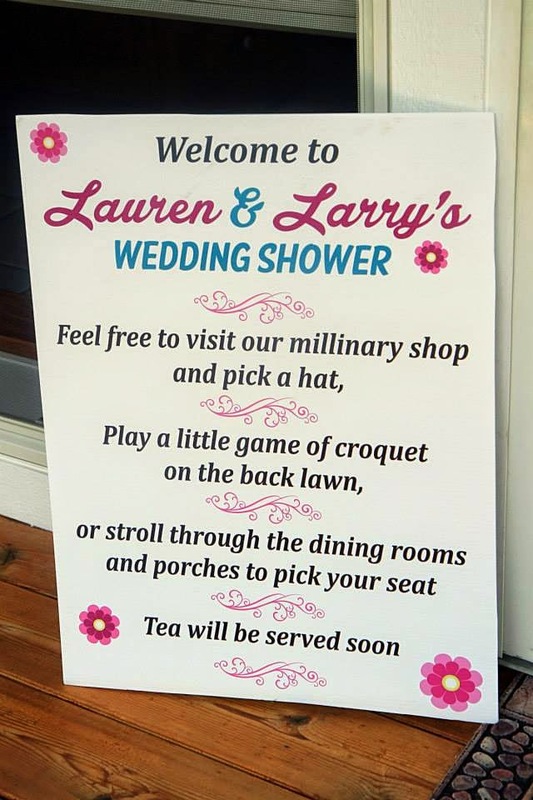 Everyone seemed to enjoy sharing this special day with Lauren and Larry, and I feel blessed that I was able to be a party of it! Some of the beautiful bridesmaids! 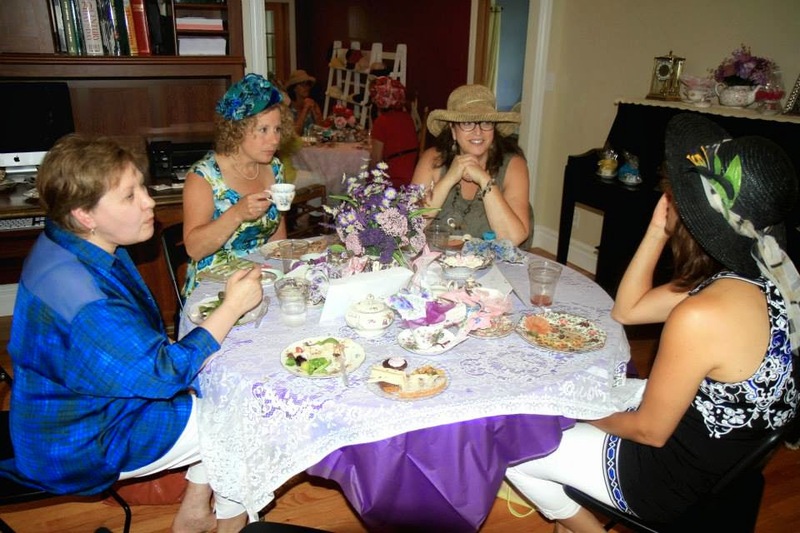 If you get a chance to attend a tea party, make sure you do! 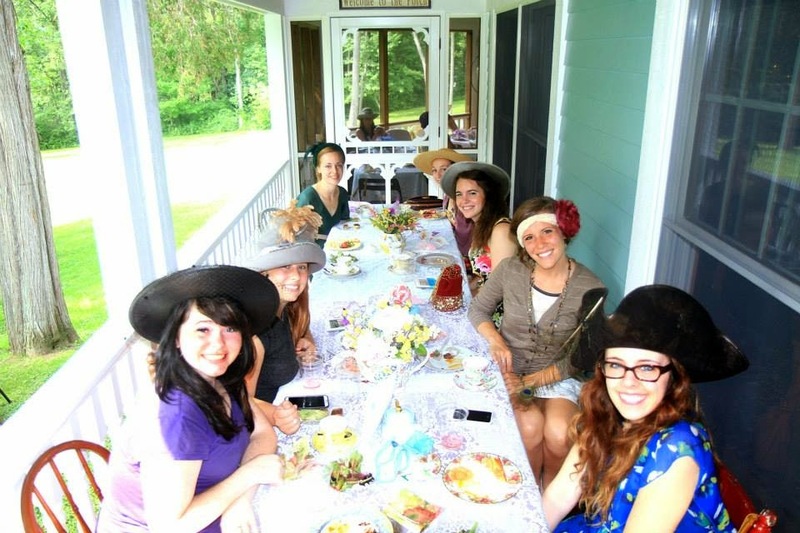 Or better yet, throw a small one for your friends and neighbors just for the heck of it... everyone loves a tea party! 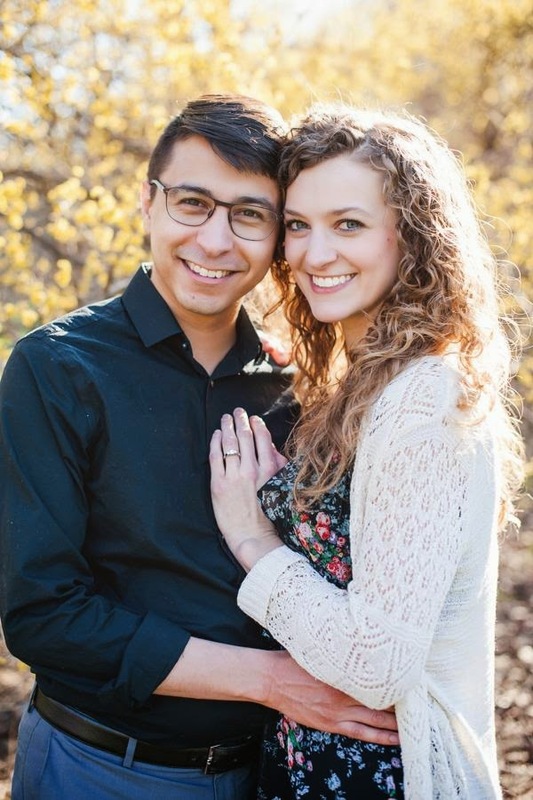 It has been a super busy summer, with Jessy's wedding just 3 1/2 months away there has been a lot of extra time spent on planning and shopping for her big day. It has been a lot of fun but it hasn't left time for much cooking or baking, so anytime I can find a quick and easy shortcut to make mealtime easier to prepare then I am a happy camper. I made this dessert a few weeks ago and it was super quick and easy and had very few ingredients! I would have to say it is definitely a peach of a recipe! I just love summertime shortcuts because no one want's to spend a lot of time in the kitchen when the weather is warm and sunny and there are so many fun things to do! Whip this up for your next summer barbecue and your guest will never know it took less than 5 minutes to get in the oven! It tastes fresh like a summer peach and would be a great dessert to throw together for unexpected company! Serve it up warm with some vanilla frozen yogurt on the side for an extra special treat! Directions: Pour peaches with juice into the bottom of a sprayed 9 x 13 baking dish. 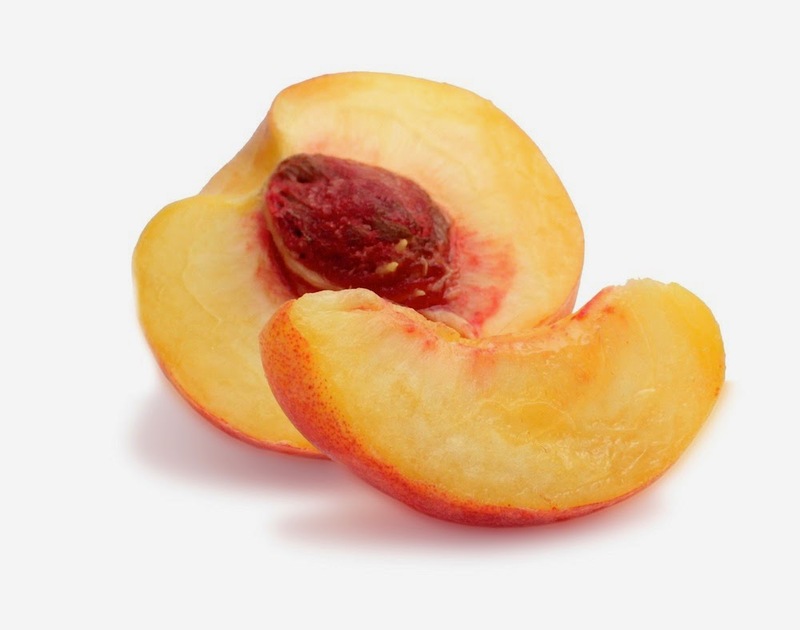 Sprinkle dry cake mix over peaches. As evenly as possible, pour melted butter over dry cake mix (it's ok if some spots are still dry). Sprinkle walnuts and coconut over top. Bake at 350 degrees for 30 to 35 minutes. This one dish wonder is a super easy way to serve up everyone's favorite deli sandwich to a crowd. I served it for dinner with some veggies and dip on the side but it would be great cut up in little squares to serve as an appetizer at a party too! 375 degrees for 8-10 minutes or until golden brown. Layer with half of the cheese and all of the corned beef. Combine drained sauerkraut and salad dressing, spread over beef. Top with remaining cheese. On a lightly floured surface, press or roll second tube of crescent dough into a 13"x 9". rectangle, sealing seams. Place over cheese. Brush with egg white and sprinkle with caraway seeds. Bake for 12-16 minutes or until heated through and crust is golden brown. Let stand for 5 minutes before cutting. Cooks Notes - You will notice in my picture that I did not have enough Swiss cheese slices so I just sprinkled some shredded mozzarella I had on hand. Also the original recipe called for sliced corned beef and I cut it in small pieces to make it easier to cut through when I was done and thought it worked out great! 9" x 13" baking dishand pinch seams together to form crust. (I chopped mine instead of just putting the slices on to make cutting individual pieces easier) sauerkraut and more cheese on top of the corned beef! crust is golden brown and sandwich is heated through. Cut into individual pieces and enjoy! Epic Fail... Petit Four Disaster! So I woke up early today and read an email from a friend of mine who is planning a shower for her daughter (my daughter happens to be in the wedding too). We had a planning meeting the other night with some of the bridesmaids and some other women that want to help. 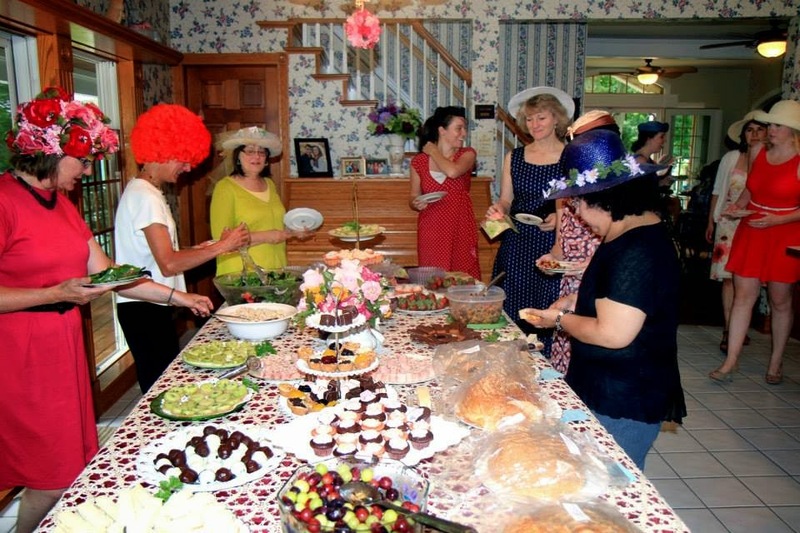 It was decided at the meeting that it would be a tea party shower. We discussed some ideas and my friend Shelley (aka: MOB) really thought it would be cute to have little petit four cakes. I have never made petit four cakes and my instant gut reaction was that it was not something that looked very easy so I suggested maybe mini cupcakes instead. 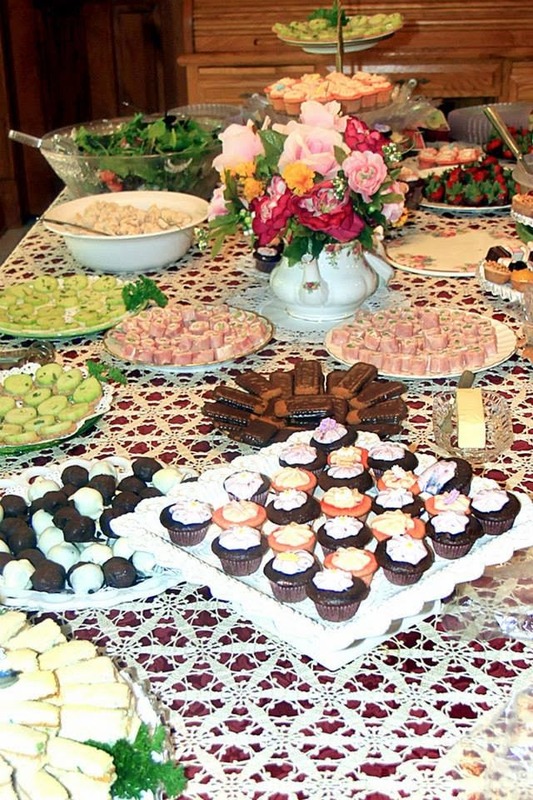 No one else volunteered to make the petit fours, so we talked about maybe buying some at one of the big box stores but eventually we moved on in our planning and left that topic go. Today the email from Shelley was just to update us on what everyone was doing/bringing to the shower and she said something about still looking for the petite fours but if we can't get them then Sandy (me) will make mini cupcakes. Well a light went on in my little brain, and I thought to myself... I have a free day and Shelley really wants those petite fours for the shower, I bet If I watched a few You Tube tutorials I could make them. After watching it I thought to myself... I got this! I proceeded to go to the store and purchase supplies for my little project... I got home and feeling very confident, I thought, what the heck, I could make them today and freeze them for the shower! Well let me tell you those little buggers aren't as easy as the You Tube videos make them look! I am sure you have all seen those posts about EPIC PINTEREST FAILS, well this was definitely one! I am sorry to say that I will not be making petit fours for the shower... or ever again for that matter!!! I should have went with my gut instinct on this one, hahahaha! Oh well you never know unless you try :). Problem was I couldn't get it to drizzle over the sides and the top just getting thicker and thicker with frosting! Unfortunately, I made my cake to thick... I made my frosting too thick... I didn't wait long enough for my cake to harden up in the freezer before drizzling... I had frosting everywhere but on the little cake bites and it was just a huge mess... I could tell I didn't have the patients to finish them and I just threw in the towel! I ended up putting some of the little squares in a 9 x 13 pan and drizzling the frosting on top... If you come for dinner at my house you might get get petit four casserole for dessert :)! Defeated... how do you like my petit four casserole? We have all had things not turn out exactly like we wanted in the kitchen and I thought you all might get a chuckle from my petite four fail today, I know I did! Oh well, if at first you don't succeed, try, try again... or not :) Sorry, I'm not posting this recipe today... I would not want to put anyone through this ordeal! And then I had to clean up the mess... UGH! I am sure the shower will be wonderful, even without petit fours... at least I tried! PS-I don't do cake balls either! 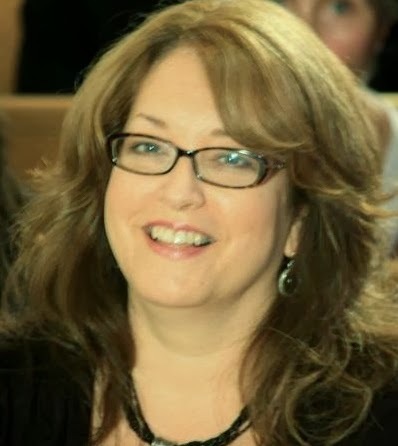 Hi, my name is Sandy and I want to welcome you to my page! I am so glad you decided to visit and my hope is that you might take something away that will inspire you to live better, love well, and create beautiful things. 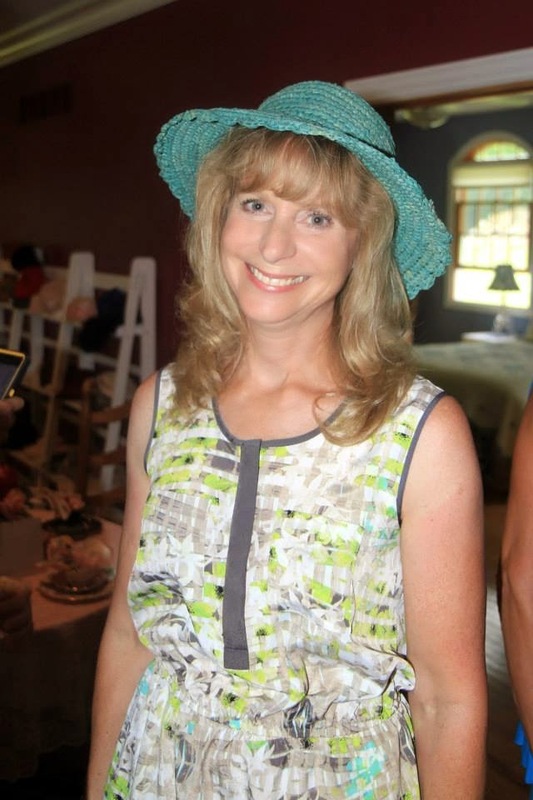 If you would like to get to know me a little better just click on the about tab on the top of this page!